Regardless of how thick—or long—your hair is naturally, you should still consider wearing extensions on your wedding day. "I recommend in almost all cases having some hair extensions," says Danny Jelaca, a celebrity hairstylist in Miami Beach who works with clients like Karolína Kurková, Winnie Harlow, and Caroline Vreeland. "Even if you have thick hair, one weft clipped into teased hair with some texture power really holds the style and gives you something to pin into if you're using hair accessories." He notes that extensions will also make any chignon or updo look fuller and require less teasing, saving your hair from all that damage. When it comes to making hair look ultra-thick, you can't forget about your scalp. "A hair-thickening colored powder for your part and hairline will make your hair look so thick in photos," he says. We love the formulas from ColorWow and Salon In a Bottle (a little goes a long way). Don't let the opinions of friends and family guide your hairstyle—wearing it up, down, in a twist, or in a bun is up to you alone, with the guidance and expertise of your wedding day hairstylist. "I think it’s a mistake truly to ask too many opinions that can make you feel conflicted," says Jelaca. "Choose a few styles and go over it with your hairstylist and come up with a plan together and then reveal it to everyone. Once it’s done everyone will love it—and keep opinions to themselves. You are the important one. Your not here to make everyone happy; it’s your day." While it may seem natural to shampoo on the day-of, celebrity hairstylist and owner of Julien Farel Restore Salon & Spa, Julien Farel, tells brides wash their hair the day before. "It's always good to wash your hair the day before the wedding with with a restorative hair treatment. It will add shine, volume, and life to your hair. I recommend the Hydrate Restore for the big day because it is very light and will make your color even more vibrant." Having bridezilla moments on your big day are inevitable, but try to keep things chill when it comes to your hair stylist and makeup artist. "Give yourself enough time to tackle any mishap that could occur [i.e. your not loving your hair, the humidity acting up, emotions causing mascara to run, etc.]. Anyone working with you should be allotted the time to do the best job that they can, plus it's less stress on you if everyone is working at a calming pace," says Janet Zeitoun, founder of SOTAH Hair and celebrity hairstylists. 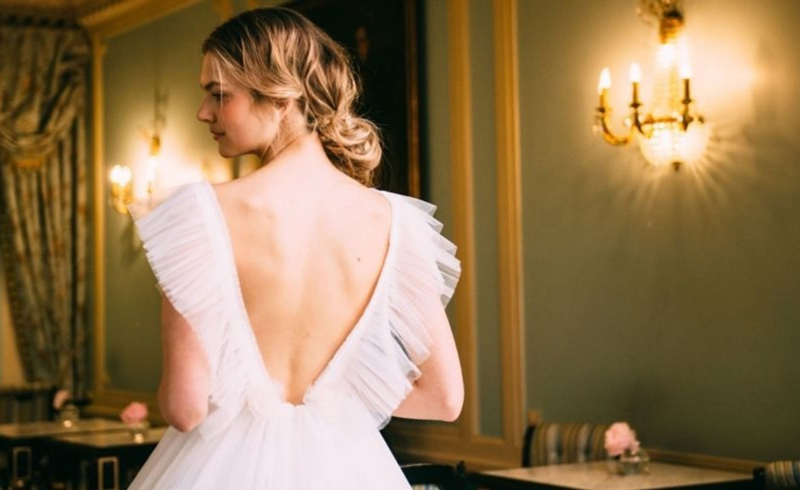 Celebrity hairstylist Kristin Ess thinks that the top hair mistake brides make is getting a fresh cut before their big day. "Sometimes when the ends are freshly cut, your hair doesn't hang on to the style it's placed in as well. It's soft and healthy– which is great–but a little wear and tear helps hold the style. I always recommend my brides get their hair cut four to six weeks before their big day." If you're still a few months out and think hair could use a little oomph, try popping a daily vitamin with biotin. "Take biotin vitamins as soon as you start planning your wedding," says Whitney Olson, co-owner of RA_Bar Beauty. "They will help tremendously and encourage healthy hair growth for those looking for lustrous hair on their big day." Your wedding day is not the time to experiment with a length, style, or texture you've never worn before. The key: Aim to look like the best version of yourself. "I love looking at old photos of brides from way back when and thinking...'this look would still work today,'" says Ess. If you're thinking of trying twists, chignons, or braids for your overall look, be sure your hairstylist is using the right products to keep the style in tact and supported. "I love our Hair Crème Therapy is a must when designing braids, twist, French rolls, or if you just desiring the perfect hydrated pretty hair eliminating the frizz without a weighted down effect. Just a little goes a long way," says Zeitoun. So you're already using a weekly hair mask — good! Now's the time to break out the big guns, starting with hair gloss. "When you go to your salon, ask them for a clear gloss. It will take about 25 minutes and will give your hair a glassy shine that will look gorgeous in photos," advises Olson. Even if you don't dye your hair regularly (or at all), a clear gloss will boost shine and make hair feel new again. It's a trend that brides seem to gravitate towards–but later regret. Save it for Coachella or your bridal shower. Because unless your are inherently bohemian, don't do it for your big day. As Ess best puts it: Flower crowns are a telltale sign you've looked at Pinterest far too much. If you haven't booked a hairstylist for the entire day, be sure to have a few hair products nearby for touchups. Throw a pocket-size hairspray, bobby pins, and a fine-tooth comb into a pouch for your maid of honor, bridesmaid, or sister to have on hand.